The AMC Theatre Support Center. Photo by Michael Robinson. For nearly 20 years, I worked in a place I dreaded. It was a stale environment that promoted what I call the “file cabinet approach.” Every day I would leave home, ride the subway to my stop at Grand Central Station, rapidly crisscross through the great hall and head toward my office in Midtown. I would walk through the office door, say good morning to the receptionist, and then relegate myself to my personal file cabinet, where I would vanish into my desk. I was surrounded by six-foot-high walls and lighting that made me feel like I was in a Walmart. This was a traditional cube in an open-place office. Each person’s desk — adorned with project pictures, family photos, tchotchkes, and perhaps a spider plant or a peace lily — offered clues about that individual’s lifestyle and professional background. Over the years, these desks began to resemble the different niches of a furniture store showroom. With lamps ranging from hip-modern to the law office green-glass shades and various other personal touches, each desk reflected a unique style. These showrooms were born from the desire of individuals to customize their patches of the real estate footprint — not an unreasonable aspiration considering that they were living in their spaces from eight to 12 hours a day. So they made the environment their own, which is what humans tend to do. What does this all mean to health and well-being in the workplace? Everything. Dissecting these cubicle showrooms reveals several common themes that are critical to the success of a project that aims to support health and well-being. Physical, social, community, career, and emotional elements each impact an individual’s well-being. Addressing these physical, psychological, social, and ecological considerations in the workplace can promote increased engagement. As with LEGO blocks, movable walls, partition-like curtains, and easy-to-move furniture all encourage workplace customization. When we give people choices, they will create the right environment for their tasks. And in the fast-changing environment of today’s knowledge workers, these tasks are always evolving. The spaces we create must be agile to accommodate fluid needs. The days of creating seas of perfectly aligned cubicles or one-size-fits-all solutions are in our rear-view mirrors. These stagnant environments often left occupants exhausted, sick, unproductive, and bored. Today, even zoo designers have moved away from pen environments. They certainly don’t work for people. When we create enabling workplaces, people go from being simply “present” to being engaged and active. This enhances the employee’s health, happiness, and productivity while improving the company’s bottom line. Increasing the exchange of differing points of view fosters innovation and leads to solutions that far surpass what can be achieved by an employee sitting alone at a monitor. It’s all about a collaborative effort. A well-designed and flexible physical environment also helps organizations meet the psychological needs of their employees. To achieve social and career well-being in spaces, we must create workplaces that consistently reward employees. This means much more than celebrating a birthday or milestone work anniversary. Employees crave a sense of purpose and fulfillment and like to be recognized for their efforts. When the organization benefits from their efforts, simple recognition can go a long way. Everyone appreciates financial rewards. Believe it or not, however, a public demonstration of appreciation and recognition can often eclipse the positive effect of monetary awards. A “thank you wall” that promotes a team that secured a big win, a buyer who closed a great deal, or an employee who raised thousands of dollars for a nonprofit can go a long way. While these acknowledgments often occur on a company’s intranet, this partially hides the accomplishment. Incorporating architectural elements and graphic displays honoring these special accomplishments in a public form can be very effective. Believe it or not, a public demonstration of appreciation and recognition can often eclipse the positive effect of monetary awards. A “thank you wall” that promotes a team that secured a big win, a buyer who closed a great deal, or an employee who raised thousands of dollars for a nonprofit can go a long way. Creating communal gardens can contribute to workplace reward programs. By permitting people to plant seeds and tend to a small garden that they can call their own, organizations provide a sense of ownership to these people. When they’re feeling stressed, they can water a plant or trim its leaves. While I’m not suggesting that offices should house hydroponic harvesting science experiments, they can benefit from small herb gardens that produce a product that employees can use to complement their lunches or take home. Small flower gardens provide beauty and a sense of psychological pleasure that simulates being outside in nature. As individuals collaborate and bond in non-traditional ways, they feel a sense of community and purpose and elevate their contributions to the business. Many organizations are focused on energy conservation in the workplace. Providing an information station such as a LEED Dynamic Plaque can communicate how much energy a space is using. This also incentivizes employees by showing them the savings their efforts are generating. It can create a sense of competition among employees who will strive to conserve even more energy. Organizations often ask employees to help contribute to saving electricity, water, and other resources, but too-often fail to communicate what those savings are. Acknowledging their efforts and informing them of the impact keeps people engaged. Companies can take this concept one step further by putting in place a policy that indicates when “x” amount of dollars is saved weekly, monthly, or yearly, it goes to a fund that buys fresh fruit, subsidizes employee gym memberships, or gives them the option to using a standing desk. Making this psychological connection through efforts and rewards is vital in ensuring that employees are connected to their work and their workplace. Working in one office with few options or choices for nearly 20 years left me feeling socially isolated. Even with 200 people working in a space on one entire floor of a building, there was limited interaction. With the invention of the monitor, people stopped looking at people and started focusing on their screens. People sitting next to each other communicated by email. Was this lack of interaction due to lack of interest in talking or did the office environment discourage talking because we didn’t want to interrupt this person or distract her neighbors? The Mindshare office. Photo by Kim Rodgers. Companies have responded to the need to encourage collaboration and private, heads-down work by going to one extreme or the other, or combining a bit of both. Neither extreme — open plan for everyone nor cubicles for all — is effective. Somewhere in the middle, there is a solution that involves understanding a company’s culture, the type of work being performed, and the people. I once conducted an unintentional test in my office by sitting on a couch located on a common-aisle space in the center of the office. I was simply looking to change my environment, but within two minutes I was joined by three co-workers who sat down next to me in this self-created collaboration spot. Our conversation soon moved from casual chit-chat to work. By the end of this unscheduled meeting, we had devised a solution to an issue we were working on for a development project. Had I not sat on that couch, that productive conversation would not have happened. Chance encounters and spontaneous exchanges occur when we give employees choices and provide them with different views. This input can be more valuable than a Google search and can generate insights that lead to innovation. To create spaces that are effective in promoting social interaction, workplace design teams need to conduct a pre-design survey and then incorporate the results in their solution. One size doesn’t fit all. But a well-balanced solution recognizes when collaboration is needed and when privacy or closed confines are best-suited to meet the needs of users. In all cases, design excellence reigns. Architectural and interior design solutions should provide the right amount of natural light, views, playfulness, order, and options. In some cases, simply giving employees access to daylight and views outside can increase focused work by 15 percent. With today’s fast-changing business climate, companies need adaptable and agile solutions. But the most flexible aspect of any space isn’t the walls or furniture — it’s the people. Companies can no longer assume that people will be assigned to one spot and stay there all day. Instead, organizations need to offer a variety of settings that promote choice and movement. Sedentary life is a major contributor to rising obesity levels and a lack of engagement in the workplace. In the United States, one-third of all people are obese and two-thirds are overweight. Spaces that encourage and promote movement, and that offer options, empower users to create their desired work setting and user experience. 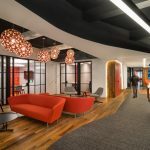 Workplace designers can encourage people to walk in the office by creating central copiers and reprographics rooms or by placing distributed services on various floors connected by internal stairs. Various rating system tools encourage this technique. Precondition 64 in the WELL Standard, for example, focuses on putting in place “internal fitness circulation” that prescribes stair accessibility, stair promotion, and aesthetics to encourage occupants to use stairs. Spaces that encourage and promote movement, and that offer options, empower users to create their desired work setting and user experience. A building’s mechanical systems can also cause many frustrations for office workers. People are often too hot or cold. Pre-occupancy surveys of spaces typically reveal a lack of balance in the HVAC system. Considering that there is a four percent reduction in productivity when an office is too warm and a six percent drop when the space is too cold, this is a significant problem. When we multiple these percentages by dollar values and salaries, this equates to tremendous productivity losses. The problems with HVAC systems are a combination of mechanical, psychological, and physiological issues. Though each of us are different, we rely on the same mechanical system to condition our individual space. One solution is to give people personal controls to regulate the temperature in their environment. This has been a longtime LEED initiative, and goes even further within the WELL rating system. With temperature swings having such a major impact on productivity, it often makes sense to invest more upfront to provide people with individualized controls and then enjoy the long-term financial benefits that come with increased productivity. Biophilic design principles can greatly enhance a space. Introducing these concepts can improve the mood of occupants by six percent. This statistic has many consequences that affect building occupant’s levels of stress in a space and their ability to achieve emotional well-being. According to the World Health Organization, 70 percent of us are overworked and suffer from “technostress.” People glued to their screens and devices are expected to cost businesses close to $300 million in the next decade. Stress affects numerous bodily systems, but has a profound effect on the respiratory system. A bad mood is often magnified or even created by stressful surroundings. Introducing patterns found in nature, plants, and water elements can have a measurable impact on reducing this stress. The Maxus and Hill+Knowlton office. Photo by Eric Laignel. An article by Terrapin Bright Green reports a study in which heart rates were measured in both urban and natural environments. The results indicated that test subjects viewed videos of both urban and natural environments. Their heartbeats were then monitored, and the results indicated that videos depicting natural environments had an involuntary relaxing effect on automatic (unconscious) functions, inducing positive cardiac deceleration as well as beneficial physiological arousal. 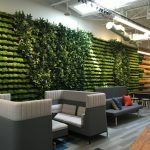 These results speak volumes on how the introduction of biophilic patterns can reduce stress by lowering heartbeats and having a calming effect in a hectic space or office building. I recently toured the American Society of Interior Design’s new headquarters in Washington, D.C. This interior fit-out project has already achieved LEED Platinum certification, and the team is aiming for WELL Platinum. Their interpretation of biophilia was not as readily apparent as one might expect, and was applied through distraction glass appliques representative of dragonfly wings. I found this to be calming and spatially inviting. Distraction paneling along the library and conference room walls ties together a long, ever-changing plane of walls and glass, leading to a junction with a pantry and a clever separation of private and more public spaces. The dragonfly patterning added visual interest and sparked creativity. And because there was no human receptionist, I was free to wander, as if on a hike through an open meadow, to find a comfortable place where I could hang out and enjoy the space until I was greeted. The rest of the office introduced biophilia through the use of herb gardens at windows and potted plants at desks. It was a powerful mix of true biophilia. A workplace must foster innovation and well-being. To provide an environment that does this, designers must respect the needs of users, support their distinct ways of working and providing an open canvas that fosters active collaboration. Though there is no formula for success, a process of discovery and working to genuinely understand the people and place will guide teams toward the best solution. The Economics of Biophilia, Terrapin Bright Green.